1:17 OK, I'm passing on this trade. Thanks for coming. See you next week. Take a course. 1:06 these two brains are the topic of my current book, Thinking Fast And Slow by Daniel Kahneman. starts making things up, and you can make bad judements, which your slow thoughtful brain would normally not make. is all I would try for. 12:25 range of the day is only 6.25 points - pathetic volatility. the trend is up. My guess is that volatility will be lower than yesterday. Recommended main pages to watch are SPKISS, MTRainbow, and Chat. 2/17/2012 1:23:07 PM MT BBB****:: Agree. But they are all worth it and you will refer back to them time and time again. 2/17/2012 1:18:30 PM MT astro:: Thank you TG. 2/17/2012 1:17:07 PM MT Tg****:: I felt like CIOC was the introductory course and FOP built on that. After those two, I'd do FOG and then CTME expands on all of the earlier concepts from a "how do I actually make this information useful for trading" perspective. So that's the order I liked but I've heard Al tell people to go straight to CTME. 2/17/2012 1:08:01 PM MT astro:: for those who have taken the courses ... assuming i started with two courses which ones would you suggest? Chaos course and FoG seem most likely candidates, but any input? 2/17/2012 1:04:37 PM MT Tg****:: Al always says +/- 45 minutes around a trade time are what we need to be watching for. When the volatility was above average I'd have a verticle line right on the tide time and one 45 minutes earlier and later than the tide time. Often price was marching right through the 110 exma right on those verticle lines. It still happens now but less often. Maybe I'm wrong about this but now that things are slow it feels like big interests are in the market constantly painting the tape. 2/17/2012 12:57:39 PM MT Tg****:: I did a pretty lengthy backtesting of the astro stuff and a lot of the inflection points in the Natal S&P futures contract did match pretty closely at times to Al's tide times but not always. Based on my backtesting of about 6 months worth of intraday charts I found the wave59 astro stuff to be pretty good but I found Al's moontide timings we get here to be generally more accurate. 2/17/2012 11:55:53 AM MT Tg****:: BBB I was a long time user (several years) of wave59 and I really liked it, especially for the access to Al's overlays. But that was when I traded via a workstation in an office with 4 3x4 format monitors. When I moved to Singapore had to simplify and went with a Sony VAIO laptop with a Hi-def monitor plus a 2nd 16x9 format monitor. Instead of trading from a desk against a wall I trade from a plush recliner with each monitor on a tray table and just watch a 1 minute eSignal chart and a 3 minute one. For live trading I think the simpler more comfortable format I have now is better than having multiple charting software and more charts. Wave59 was stronger than eSignal for backtesting beyond the past few months and I do miss that aspect of it. 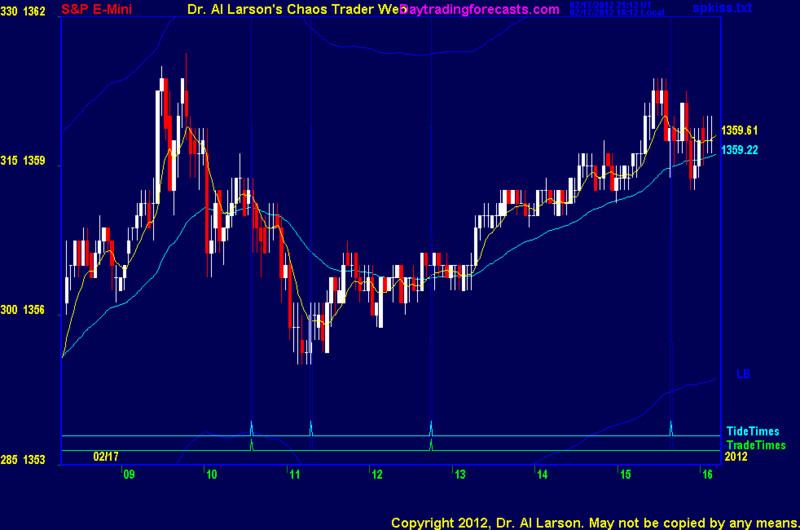 2/17/2012 11:09:55 AM MT Tg****:: lots of 2 tick 1 minute bar doji candles and a flat as a pancake 110 exma for over an hour. The cyclicality of volatility is interesting. 2nd half of last year was so much like 2nd half of 2008, similar to early 2009 got a good bump up with most of it on gaps and more quiet days than good ones. 2/17/2012 9:28:48 AM MT Al****:: BBB-I go by the EXMA's as on my MTRainbow chart. These are computed using one minute bars and only data in the 8:15 - 4:15 Eastern time frame. Other systems may get somewhat different values. 2/17/2012 9:28:04 AM MT AG:: BBB - check MTRainbow chart. 2/17/2012 8:19:29 AM MT astro:: are the suggested trade times in mountain or eastern time? 2/17/2012 8:00:25 AM MT BBB****:: I have esignal through my workplace and don't know about IB. Sorry. 2/17/2012 7:51:22 AM MT sdg:: BBB- Wave 59 appears compatible with IB data feed as well. Do you know the difference b/w the two? 2/17/2012 7:41:17 AM MT BBB****:: Tg - do you recommend it and use it? sdg - I have looked at wave 59 and if you can get a data feed from esignal it will use that. I think it is only $90 a month if you have a feed. 2/17/2012 7:37:54 AM MT sdg:: Data feed; Wave 59 or IB? Right now, I would be charged at the professional levels, so trying minimize cost and reduce redundancy. 2/17/2012 7:35:10 AM MT Tg****:: it's in the program. 2/17/2012 7:23:43 AM MT BBB****:: Al, I have been looking into the WAve59 and did not realize that FOP and FOG could be used on there. Is it in the programs or is it still just using Mylar overlays? 2/17/2012 7:11:19 AM MT sdg:: Thanks Al, that was my first choice on brokers. Not familiar with Wave 59, but will do the research. sdg: Interactive Brokers is excellent. Many of my clients like Wave59 since it can do the FOP and FOG patterns after you take my courses. 2/17/2012 6:56:06 AM MT sdg:: Good morning all. I have been watching Al for probably close to 10 years and ready to pull the trigger (life-long goal of trading for a living). Looking for recommendations on software and brokers, thanks!